As we enter the season of New Year's resolutions, learn how you can leverage data to achieve your wellness goals. The passion that many nonprofit data nerds feel for our work is a double-edged sword. On the one hand, that fervor helps us to keep going in the face of difficult challenges, like analyzing a huge data set. On the other hand, we can be so driven running data visualizations at the keyboard for hours that we don’t stop to refuel or even notice if we are experiencing symptoms of burnout. 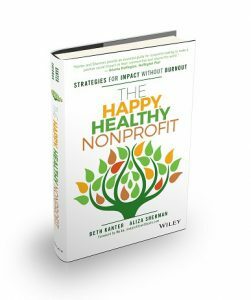 In my new book, The Happy Healthy Nonprofit: Strategies for Impact without Burnout, co-authored with Aliza Sherman, we lay out the symptoms and causes of burnout and the remedies that can be achieved through deliberate self-care. We discuss strategies for bringing self-care into the workplace or “We-Care,” but we believe it is important to begin with the individual. The practices for self-care that we describe in the book are based on insights that we gleaned from putting the techniques into practice over the past few years. As someone who loves using data for decision-making, I found the health data generated by my Fitbit was highly actionable. Despite what some vocal critics of fitness trackers say, I found that my Fitbit data helped me become aware of my unhealthy habits so that I could pivot to healthier ones. If you are responsible for working with data at your nonprofit, it is probably just one of many other responsibilities on your plate. Where can you start to make noticeable healthy changes in the way you work and live? We have some suggestions. According to the CDC, insufficient sleep is a widespread public health problem. Don’t fool yourself with facile idioms like “I’ll sleep when I’m dead.” Sleep deprivation can lead to an increased risk of chronic diseases such as diabetes, stroke, high blood pressure, heart disease, obesity, and poor mental health, as well as early death. Showing up to work sleep deprived can put you in the same cognitive state as showing up to work drunk. Would you run a brainstorming meeting or analyze surveys after tossing back several shots of tequila? How much sleep do you need to be your most productive self? There is no magic number. The ideal number of hours per night varies by age and is different from person to person. The National Sleep Foundation undertook a comprehensive research study to answer this question and now provides evidence-based guidelines on how much sleep you really need at each age. Most adults need between seven to nine hours of sleep per night. While there are a variety of different gadgets that you can use to track your sleep, I use the Fitbit Charge 2. The trackers are not perfect and should be considered a rough guide, but they do a decent job of recording your total time asleep, number of periods when you are restless or awake, and total time spent restless or awake during the night based on your body movement. By logging my sleep hours and keeping a journal to track my mood, concentration and productivity, I discovered that my optimal “magic number” is about 7 hours and 45 minutes of sleep per night. The value of this exercise was that it inspired me to rethink my routine about bedtime rituals. I realized that I was in front of my computer monitor, trying to squeeze out one more email or bar chart before calling it a day. But staring into the “blue light” of a monitor or smartphone screen right before bed has been shown to disrupt melatonin levels and delay the onset of sleep. I created a better bedtime ritual for myself that includes meditation and other calming activities which allow me to ease into restfulness. Having my sleep data in hand allows me to set a sleep schedule and stick to it, and my Fitbit sends me notifications when I should start my bedtime routine. Once I was able to achieve my optimal number of 7 hours and 45 minutes of sleep per night, I had more energy, felt better, and was motivated to build other healthy habits such as daily exercise. In terms of fitness, simply adding any type of movement in your day can invigorate you and could even save your life. As Nilofer Merchant points out in her popular TED Talk, “sitting is the smoking of our generation.” Here again my Fitbit helped me become aware of my exercise habits. I started with tracking my baseline activity level: about 2,000 steps a day. Seeing this data forced me to rethink how much time I was spending on my rear end in front of a monitor staring at a dashboard. There were days when I would even eat lunch at my desk, using my computer keyboard as a lunch tray. I started off with modest step goals, and added steps incrementally each week, 1,000 steps at a time, all the while monitoring my progress on my Fitbit dashboard. It inspired me to think about ways to get more steps in during the day, such as taking a walk at lunch time, which added an extra 2,000 steps. Each week, I kept upping my goal by just 1,000 steps until I got to 10,000 and beyond. Not only was I able to drop weight and improve my health biometrics like blood pressure and cholesterol, but I discovered that walking helped me manage stress and improved my ability to think clearly. Walking is the perfect activity for reflecting on the bigger pictures and deeper meanings of our day-to-day work. A brief, brisk walk does wonders for improving our pattern analysis and creative thinking. Recent studies show that prolonged periods of sitting are linked to higher incidences of many diseases. Therefore it is important to move for a few minutes each hour during the day when you are sedentary. My tracker now comes with a feature that will notify me every time I need to fit in 250 steps after sitting for awhile. I have set this notification so that it is not a distraction or interruption but rather a useful nudge to reboot my brain and refocus my concentration – all while helping me avoid long-term health problems. If you decide 2017 is the year to improve your health, happiness and productivity, you’ll be pleased to know that the process is already familiar to you: identify a goal, collect data, track your progress, and reflect on how to further improve your outcomes. You will be a happy, healthy data nerd before you know it!